How many times have you asked your child, “How was your day?”, only to get the response, “fine”? If your number is too many to count, you are not alone. 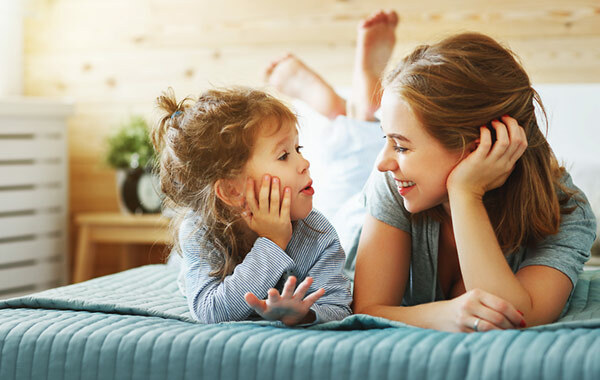 Many parents struggle with ways to reconnect with their children after a long school day. What was your high and your low? Like a mountain, we all have peaks and valleys throughout the day. Routinely asking this question can help normalize this experience for your child and encourage them to identify and communicate about both the highs and the lows. Who did you sit next to during lunch or what did you play during recess? This question is helpful to track any patterns of friendship changes, opportunities for new play dates, or even potential social challenges important to monitor. What’s one way you were kind to someone else? Did you share any school supplies or invite someone to play with you? This question encourages the value of community building. What’s something that you’re proud of from today? Building self-esteem and confidence is critical within healthy development. If you can, try to reframe your own feelings of pride to guide your child in feeling proud of him or herself. This way, they are less likely to develop patterns of looking for external validation and instead develop strong self-assurance. When did you stick with something that was tricky? This question reinforces the concept of “grit” and encourages your child to develop perseverance skills. Even if your child still gives a vague answer or can’t seem to remember, keep asking these types of open-ended questions each day to show that you care. Be sure to let your child know about your new game plan in advance so they can look for experiences to share during their day. You may also try the game, Two Truths and a Lie. This is a fun game during which your child is invited to share two true facts and one lie from their day while the other person then guesses which replies are the truths and which is the lie. Not only can this game increase your knowledge of what is going on with your child at school, but it can also strengthen the transition home and reconnection through playful interaction. You might even consider sharing two truths and a lie from your day as well!